Commissioned by the Appalachian Regional Commission, this report accomplishes three aims. First, it offers a quantitative portrait of economic diversity trends in Appalachian counties and sub-regions, benchmarked to U.S. trends. The portraits draws on four complementary indexes of diversity: industrial, functional, occupational, and knowledge, with the first two based on the mix of industries in a place and the latter two based on the mix of occupations. Second, the report summarizes diversity trends, economic development practices, and diversification strategies in ten Appalachian counties. 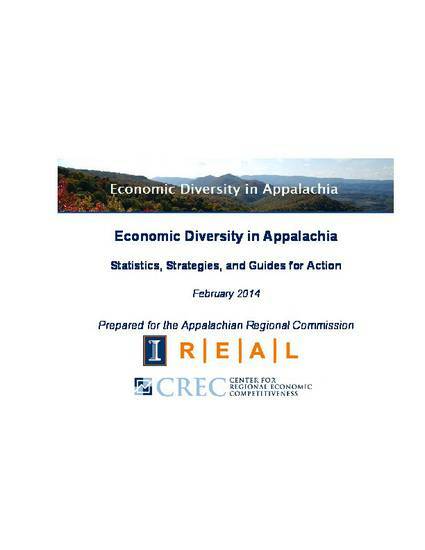 The ten cases offer insights into economic development practitioners’ understanding of what economic diversity means for their communities; describe how a diverse or non-diverse local economic structure can aid or thwart economic development planning efforts; and identify particular diversification approaches that are meeting with success in the Appalachian region. Third, the report offers general lessons about what diversity means for economic development practice.